Q. When "Citizenfour," Laura Poitras's film about Edward Snowden's revelations of government electronic monitoring, won the Oscar for best documentary, I started to wonder when the police first got into the wiretapping business. Any idea? A. Wiretapping has been around almost since the invention of the telegraph. 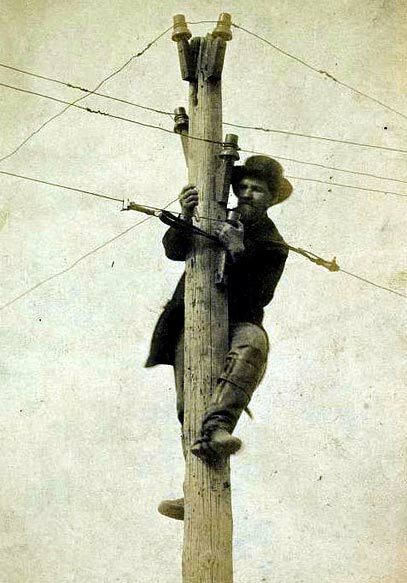 Union and Confederate soldiers intercepted one another's telegraph wires during the Civil War, scraping off a small piece of insulation and splicing their own line to the enemy's. Later, private detectives spied for clients. The use of a wiretap in a Connecticut divorce case in the 1880s led that state to ban the practice in 1889. News services stole one another's articles. The use of a wiretap to convey false cotton prices in London, a plot aimed at stock speculators, set off a panic in But in the postwar 19th century, much wiretapping of telegraphs and, later, telephones was carried out by crooks trying to cheat other crooks. A favorite target was illegal bookmaking parlors, which relied on the telegraph for racing results. Past-posting, a fraud that figured in the movie "The Sting," was sometimes accomplished by cutting the line to the bookie joint, holding it up long enough for confederates to get the results and make winning bets, then restoring service to the parlor. Another system was to have the confederates make bets on prearranged horses, then cut the line and telegraph fake results to the bookmakers, with the chosen horse winning. The bettors would quickly collect and take off before the real results became known. The New York Police Department is believed by some to be the father of official government wiretapping, beginning in 1895 under Mayor William L. Strong. A New York State investigation in 1916 into fraud at the state's Board of Charities turned into a sensational account of official wiretapping. Mayor John Purroy Mitchel testified that he had approved three wiretaps in the charities investigation, one of them on a minister's phone. According to information provided to the investigating committee, no request was ever refused by New York Telephone, provided that the police said the wiretapping was intended to prevent or detect crime. Details of the 1895 wiretapping were not made public, but an interesting speculation is possible. In 1895, Mayor Strong appointed Theodore Roosevelt, a fellow Republican reformer, to the New York Police Board, which elected him its president. Roosevelt was an ardent moralist, and under his leadership and that of Commissioner Andrew Parker, the Police Board banned the use of police informants - usually referred to then as stool pigeons. "Roosevelt and Parker were adamant about not paying one-half the city's criminals to snoop on the other half," Richard Zacks wrote in "Island of Vice: Theodore Roosevelt's Doomed Quest to Clean Up Sin-Loving New York" (Doubleday, 2012). The ban did not last long, nor did Roosevelt's tenure on the board. But it is possible that the police, deprived of one of their most potent crime-fighting tools, may have turned to wiretapping as an alternative. Email: fyi@nytimes.com. A version of this article appears in print on March 1, 2015, on page MB3 of the New York edition.